Does cross-sector collaboration really produce better results? May 18 2016 Research to Practice: Does cross-sector collaboration really produce better results? Through his research, Doberstein was able to identify key design and management features that contributed to the collaboration’s ability to arrive at decisions that would have been difficult for policymakers in a single sector to achieve alone. His findings are relevant to managers of collaborations in which a kaleidoscope of expertise and actors shape decision making around prioritization and investment of public funds. Select partners who are expert in their field but also open to hearing new information — and willing to change their mind on the issues — to participate in the collaboration. Participants should be able to confidently communicate their knowledge of their field but also able to listen and allow their thinking to be informed by new information, instead of holding an uncompromising ideology or vision. Collaboration managers may ask potential partners to complete a self-assessment that examines whether they are open to others’ perspectives and willing to make decisions that are best for the partnership rather than in their own interest. “Having a clear vision, a positive demeanour, a willingness to listen, accept new knowledge, and perhaps change their mind on issues, is essential,” Doberstein told us. Without these qualities, a collaborative advantage is less likely to be achieved, and partners are more likely to simply bargain for their respective best interests. To help potential partners perform a self-assessment, refer them to Tool # 1 Assessing Partnership on pp. 5 – 6 of the Capacity Project Toolkit and the Organizational Readiness Assessment on p. 19 of Engaging Your Community: A Toolkit for Partnership, Collaboration, and Action. Both resources provide helpful questions for individuals or organizations to consider before entering a collaboration. To identify experts on the issue your collaborative aims to address, see p. 23 of The Partnering Toolbook from The Partnering Initiative for a stakeholder mapping exercise. Balance time limits on deliberation with flexibility in allowing for additional discussion that may arise. While the perfect balance may take years to achieve and will vary depending on a collaboration’s size and scope, a general guideline is for collaboration managers to allocate and communicate to partners exact time measures for deliberation while also anticipating where further discussion time may be necessary and remaining flexible to that possibility. This keeps discussions focused but allows for enough time to thoroughly address the issues, whereas “without some time pressure and structure, collaborations will tend go in circles without achieving consensus,” Doberstein shared with us. 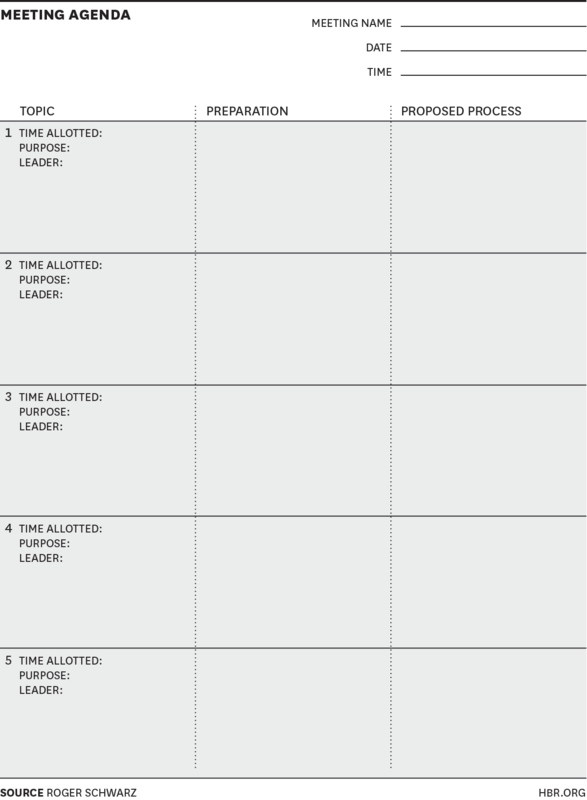 For an example of a meeting agenda that can be used to record time planned — and actually used — for discussion in meetings, see the Meeting Agenda Template from this Harvard Business Review article on how to set an agenda for an effective meeting. 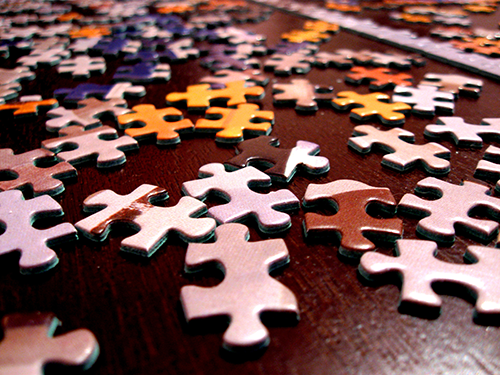 Delegate complicated tasks to smaller groups that will work independently and report decisions back to project managers. Splitting a large group into smaller groups to handle tasks and make decisions will increase the collaborative’s efficiency. For example, the collaborative needed to take a close look at program proposals for homeless services, a task that involved detailed analysis and would be difficult for all 120 members to perform together. The managers divided the Committee into smaller groups of five or six individuals, retaining the Committee’s diversity of expertise and experience within each of the small groups, ensuring that shelter providers, youth specialists, and mental health professionals were not placed all together in one group. This helps a collaboration move forward more efficiently while ensuring that it is still making “policy and program decisions with the most insight and expertise at the table,” which is “the whole point of collaborative governance,” Doberstein shared with us. During small group work, the manager and supporting staff were present to answer technical questions about budget and administrative regulations. See Developing Multi-Sector Task Forces or Action Committees for the Initiative from Community Toolbox for further discussion on the benefits of forming small groups, how to define the relationship of the smaller group(s) to the larger collaborative, how to define each group’s purpose, and more. For an example of a governance structure set up in this manner, see our case study Preparing Students for STEM Jobs in New York City. In this collaboration that created and now oversees a six-year high school to prepare students for STEM careers, a Steering Committee made up of individuals from each sector makes decisions based on the work of planning committees, which develop recommendations and provide updates on specific areas of school functioning, such as course scope and sequence, and workplace learning. Help build an atmosphere of trust and openness, which can help partners in navigating potential conflict further down the road, through guidelines and exercises included in Effective Internal Communications on pp. 79 – 87 of the The Partnership Toolkit from Collaboration Roundtable; Section 3: Communicating Within the Partnership on pp. 22 – 25 in Talking the Walk from The Partnering Initiative; and Section 3 on trust in Collaboration Toolkit: How to Build, Fix, and Sustain Productive Partnerships from the U.S. Department of Justice.